Holidays and special events present a host of unique opportunities for social media campaigns to drive revenue growth. 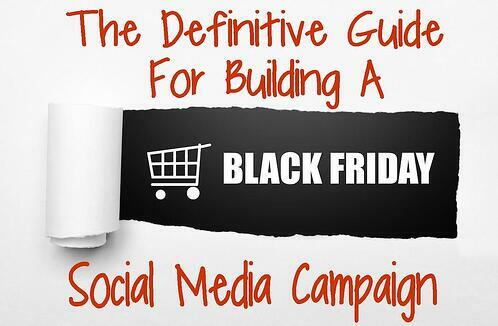 In 2014, Kohl’s leveraged Black Friday for a huge 400% growth in their social media engagement. This increase in social media engagement allows brands to remain top-of-mind to consumers, and empirical data suggests that this engagement drives sales and generates customer loyalty. Before beginning to craft a holiday social media campaign, there is some research that needs to be completed. In order to create a campaign that attracts leads, it is essential to know the persona of the ideal buyer. Spending the time to complete a persona analysis can save countless hours of wasted efforts and misused dollars. This is a great example of a persona analysis that is chocked full of information that can be leveraged in campaign planning. The insight from a persona analysis provides the blueprint on what platform(s) to utilize for any given campaign. Perhaps the analysis indicates that the buyer persona if 18-25, spends a lot of time on mobile devices, and is likely to use Snapchat and Instagram. Crafting a campaign around this information would include the utilization of pictures, hashtags, and Snap stories. Last year, Birchbox was very successful in their 2016 Black Friday push of flash sales via Snapchat. This style of detailed persona analysis can be especially beneficial when utilizing targeted marketing within Facebook. Facebook offers a comprehensive list of demographics, interests, and behaviors for targeted ad campaigns. This information can save hundreds of advertising dollars that would otherwise be spent on a cold audience. A theme will start to emerge here; planning is key. A content calendar is an essential part of the planning process. Creating a content calendar allows for a high-level examination of the direction a brand is heading, without getting caught up in the specifics of what each piece will eventually look like. Content calendar templates can be found on various websites, including this template published by Globe Runner. When plotting pieces for a content calendar, make sure to choose a variety of content types. Varying content keeps readers engaged and more likely to frequent a website or email newsletter. Here are 105 types of content that should jump start a brainstorming session. Be sure to account for how long each piece of content will take to develop, as things like videos or infographics typically take longer to create than a blog list or a Q&A. Guest blogging is an excellent way to expand a marketing campaign. Collaborating with bloggers in a similar field allows marketers to capitalize on list sharing, thus introducing their brand to a new audience for little to no investment. This tactic is the online equivalent of relationship building and teaming up with like-minded colleagues for a mutually beneficial endeavor. What makes a social media campaign success? How do marketers tell if a piece is a hit or a miss? Constant and accurate tracking is the key to determining what is working and what needs improvement. Tracking comes in many shapes and sizes and this is an area where a tool is absolutely essential. In fact, there are numerous tools to assist in the tracking process including these 25 tools that rate marketing pieces. Options for tracking range in price from free tools like the Google Analytics, to mid-range options such as Hootsuite, to more comprehensive tools like Hubspot. Most marketers find that a combination of a few tools will achieve the desired result for tracking their content distribution. The integral thing to keep in mind when setting up a tracking strategy is that more information is always better. While some of the information being collected may not become useful immediately, having this data year over year allows marketers to make informed decisions about future marketing plans. Gone are the days of placing cookie cutter ads in newspapers to draw people to a brand. Today, the name of the game is being unique. The pipe dream of every marketer is creating something that goes viral. Only a small percentage of pieces ever go viral, so it is important to remember that buyers are able to detect authenticity. Create unique marketing campaigns that encourage potential leads to engage with your brand. Brands win social media favor by stepping outside the lines of expectations. In 2013, Charmin broke down the barriers of potty talk and encouraged communication from their buyers with their hashtag tweetfromtheseat. Starbucks uses Instagram to give their customers 15 minutes of fame, regramming photos posted with Starbucks-related hashtags. Facebook was in a frenzy in the summer of 2014 supporting ALS with the Ice Bucket Challenge. The success of these campaigns hinged upon the repeatability of user interaction, playing on the common desire of wanting to feel a part of. Check out the most popular Facebook campaigns of 2017 here! Too often, marketers make the mistake of spending the bulk of their time on writing content and not enough time paying attention to the finer points of making a successful campaign. Hubspot suggests that writers spend an equal amount of time creating a headline as they do writing a piece of content. Out of every 10 people that see a headline, only 2 will go on to read the rest of the piece, so marketers have to work hard to draw the attention of the reader. So what makes a great headline? Numerous studies have been done on how readers react to headlines. While it is certainly not an exact science, a few constants come through from most of these studies. As was mentioned above, the key to successful headline writing is in the time spent on creation and testing against an audience. Overtime, marketers learn what their audience responds well to and how to capitalize on those headlines. Many elements of a successful social media campaign appeal to the emotions of the lead. Contests provide people an opportunity to engage, share, and be hopeful that they are going to win the prize being offered. The positive outcome of these contests hinges upon users becoming invested because they believe it is possible to win. Contests are another area where lack of authenticity can wreak havoc on a brand. You check out our case study from the latest contest we ran here. Eggo asked their Facebook fans to submit their recipes using their favorite brand of waffles and post pictures of the finished product. The Great Eggo Waffle Off campaign was a smashing success that tapped into a huge community of willing participants, mom and food bloggers. Eggo gave away $5,000 to the winner and $2,500 to two runners up. This was a small price to pay for the national attention this contest earned the brand. Brands that find favor on social media are those who offer value to their customers and are known as an expert in their field. Passing knowledge along to potential leads establishes a form of trust in the brand. Companies need not be afraid of sharing “insider secrets” on how to best utilize their product. Readers feel like they are getting a peek behind the velvet rope and will often subscribe to a brand who publishes honest and useful information. In 2014, Lowe’s used Vine to provide expert advice on a series of home care how-tos. They created 50 six second clips of tricks for either remedying or simplifying projects around the house. The result was astonishing, earning them awards for advertising, as well as a massive amount of online attention. The most amazing part about the success of this campaign is that it cost only $5,000 to create. The importance of content distribution is often overlooked. For those marketers who work within a limited schedule, which is most of us, automation is the linchpin to success. Automation tools allow marketers to schedule posts, track competitors, and monitor engagement while saving time and increasing efficiency. Most automation software includes reporting features that provide insight into what pieces are gaining traction and which pieces are falling flat. Most of these tools provide easy access to create things like landing pages, information captures, and surveys. Utilizing automation software will allow marketers to maximize their return on investment for every piece of content they create. Your content should be targeted to move leads through the buying process, and automation is the easiest way to do this. Some of the more advance tools include complex rating systems that score leads engagement and place them in certain campaign sequences according to their rank. This allows a brand to stay top-of-mind to those who are close to making a purchase, while trying to re-engage those who may have gone cold. The ultimate goal of content marketing is to create engagement with customers. This is a shocking area where many brands drop the ball. It is an easy opportunity to provide information, answer questions, and move leads through the buying process. Social media sites can also be leveraged to monitor what customers are saying about a brand, whether it be good or bad. Not only is monitoring the conversation on social media sites a great way to engage with customers, it is also an essential way to monitor a brand’s reputation. The quality of social media interaction is where many brands win or lose. British Airways got lambasted after a less than stellar response to an unhappy flier. Conversely, in 2010 Dominos used customer feedback on social media to improve their pizzas, with the new recipes earning rave reviews. Customers felt that their opinions mattered and the brand ended up with a better overall product; certainly a win-win scenario. Creating a social media campaign can seem like a daunting task, but when brands hit the mark, their work pays back in spades. Utilizing some of these well-known tactics and adding a healthy amount of creativity is sure to put you on the right track for success. We want to hear from you. What tips do you live by when creating campaigns? Where do you go for inspiration and what successes have you had? Do you have an example of a campaign that wasn’t quite a winner that we could learn from? Share with us below.